Extracts all files like photos, contacts, messages, notes, call logs, etc. from iTunes backup. Allows to preview iTunes backup details and selectively extract. Works with all Windows and Mac OS versions. Supports all iOS devices like iPhone X to iPhone 4, iPad, iPod touch. iPhone and iPad devices are very simple to use, but when someone comes across a technical problem they get extremely complicated. One such problem is accidently deleting the data from iTunes backup that you were not intending on deleting and somehow got it deleted. However, there are free iTunes backup extractors that can help you get your files back just the way they are and that too without any effort. In this article, we are going to go through the top 6 free iTunes backup extractors for both Mac and Windows users. If you have been struggling with a similar issue, then you would be glad that you made it here. 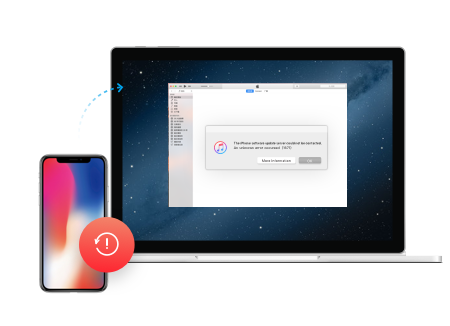 dr.fone - Recover (iOS) is the world's first tool to extract backup data from iTunes, and supports the extraction of all kinds of video, music, app, contact, call history, message data. You can preview what data was stored in iTunes and then choose to extract. 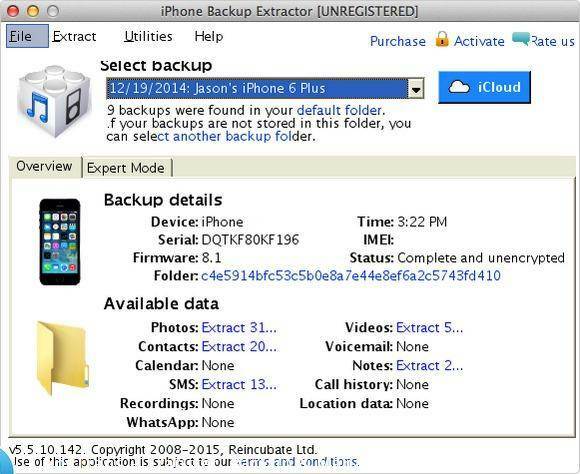 In addition, you can also use this tool to extract iCloud backup. World's 1st iTunes Backup Extractor. Extract photos, videos, contacts, messages, notes, call logs, and more. Preview and selectively extract what you want from iPhone, iTunes and iCloud backup. Supports iPhone X / 8 (Plus)/ iPhone 7(Plus)/ iPhone6s(Plus), iPhone SE and the latest iOS version fully! Fully compatible with Windows 10 or Mac 10.8-10.14. For your convenience, you can free download and install dr.fone by clicking the below button. Launch dr.fone and click "Recover". 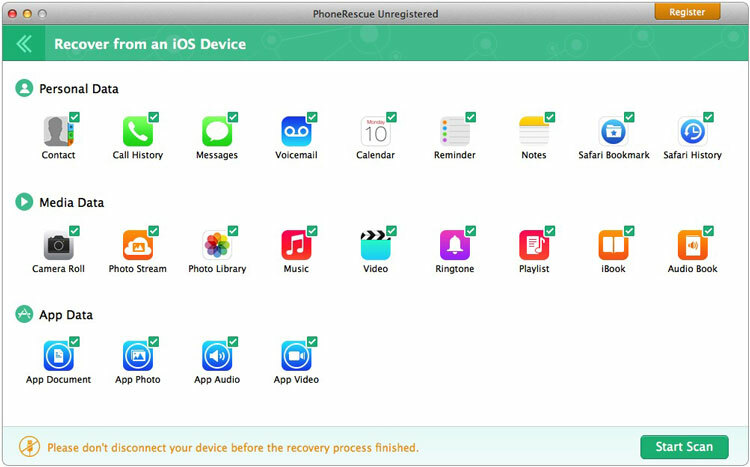 dr.fone - Recover (iOS) provides several ways of recovering data. Since we are going to extract from an iTunes backup, we would select that option. Then you will see all your iTunes backup files listed. Choose the one you want to extract and click “Start Scan”. After clicking the “Start Scan”, dr.fone looks for the files and shows the list. You can view the list and select the files you want to extract. After clicking “recover” you will be asked whether you want to store the files onto your computer or your device. Select between these options and the files will be saved accordingly. Provides the recovery of 20+ data types. Has the ability to save Text Messages and Call History. Available on Mac and Windows OS. Export data directly from iPhone, iPad and iPod touch. Extract from iCloud Backup/iTunes Backup, even if the backup is encrypted. You need to upgrade to the Pro Version in order to extract data. The basic version will only preview the lost/deleted data. 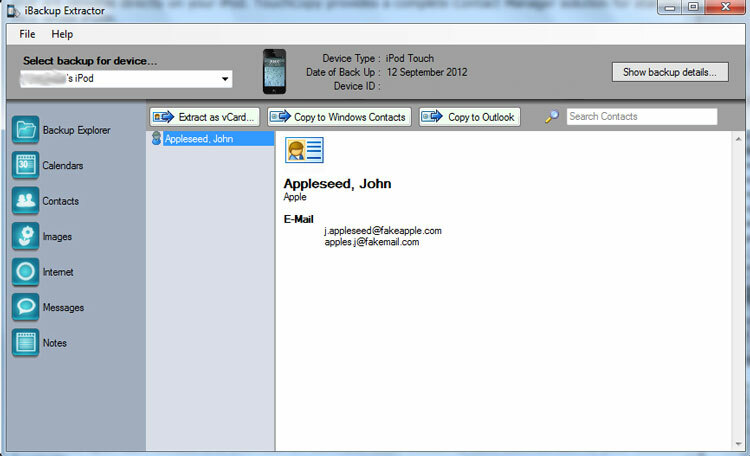 Has the ability to recover Text Messages, Call History, Emails and Voice Mails. Preview screen is not clear. 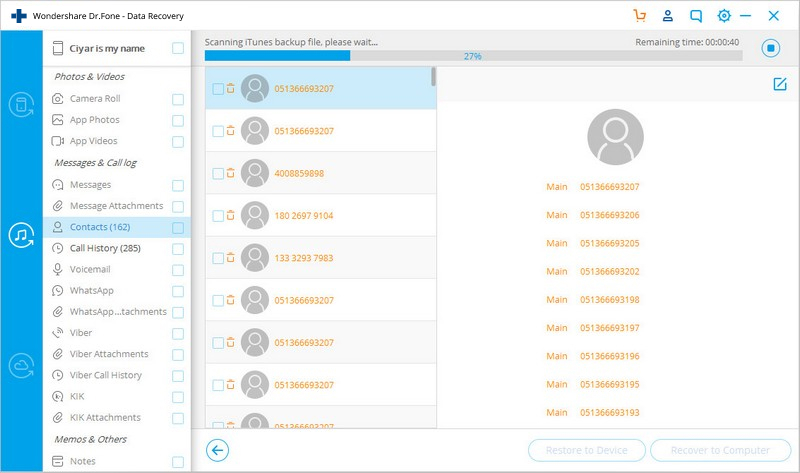 Supports the recovery of all the personal data, such as, contacts, messages, call history etc. 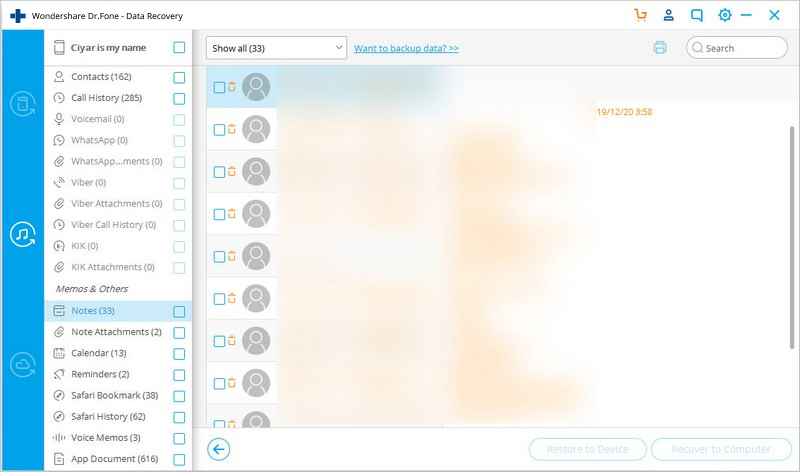 Can find all of iPhone backups on Computer. Extract from iTunes Backup, even if the backup is encrypted. Can’t extract from iCloud Backup. Can’t preview files for backup. Clean interface, simple to understand and handle. 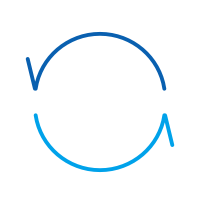 Two recovery modes: Recover directly from iOS device or extract from iTunes. Previews the files before recovery. No need for recovering data from the phone beforehand. Can transfer data between computers and iOS devices. Need to connect the iOS device with the computer before extracting data. Inefficient in finding all the files. Easily provides iTunes backup information. 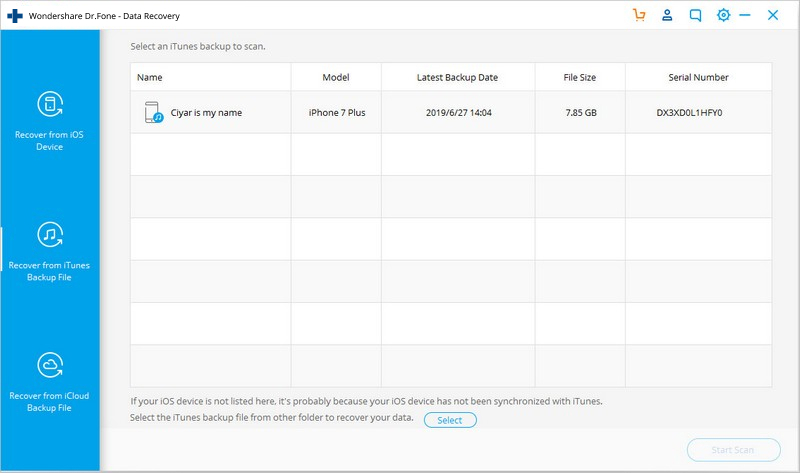 Can extract data from iCloud/iTunes Backup. Provides an expert mode for extracting data from iPhone. Don't know how to play iTunes M4V videos on Android phones or tablets? This article tells you 4 ways to watch iTunes movies on Android devices.